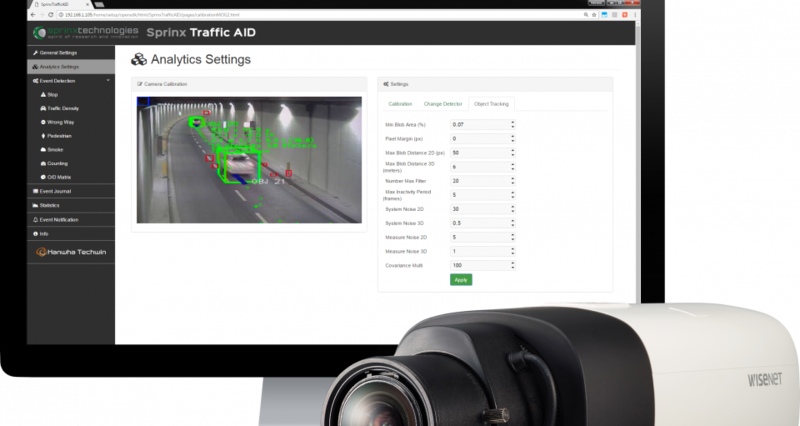 Traffic AID is an edge-based application running on-board Hanwha Techwin high definition Wisenet X cameras. The full Traffic AID solution can reliably detect incidents and events in traffic flow on critical infrastructure such as roads, highways, tunnels and intersections. Traffic AID generates an alert when traffic incidents occur, as well as provides reliable traffic flow data. All information is then delivered via an intuitive web user interface. The PSD application can detect a stopped vehicle and a pedestrian in a tunnel or on a roadside such as hard shoulders and emergency laybys. 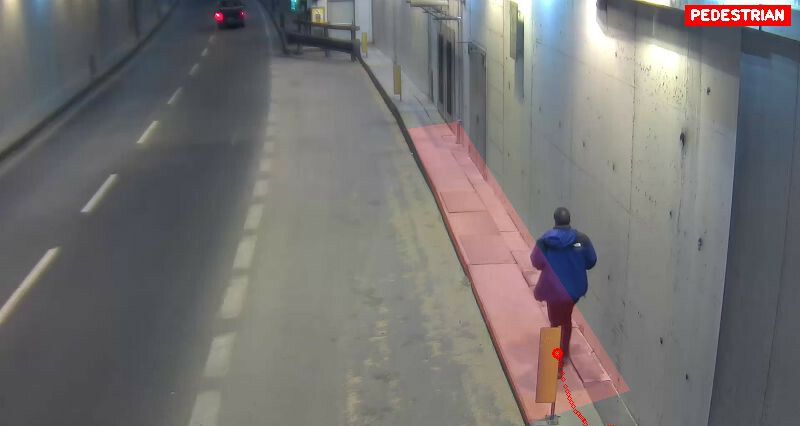 The Traffic Flow application is the ideal video surveillance solution for monitoring traffic on roads, motorways, tunnels and in cities. It can detect stopped vehicles, estimate the traffic flow and automatically alerts operators to queuing and congestion on the roads. Based on advanced video detection technology, Sprinx Traffic Flow allows you to monitor two different lanes/zones of traffic simultaneously. The Traffic Data application has been designed with city environments in mind for monitoring the flow of motorbikes, cars, lorries and buses. 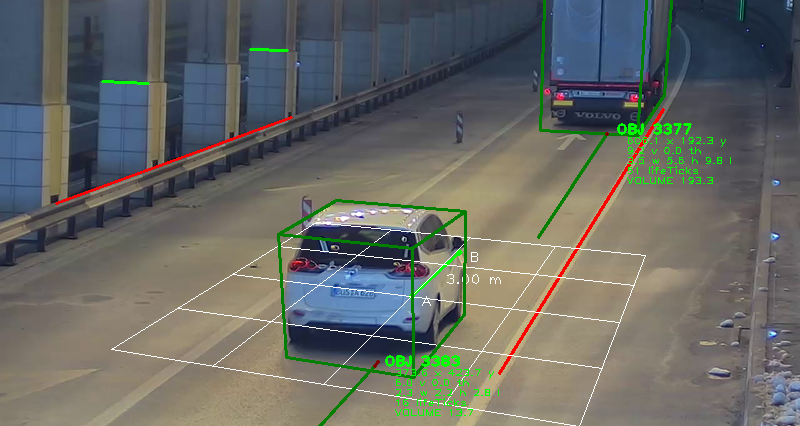 It can keep track of vehicles moving in a Wisenet X camera’s field of view and is able to collect data on two independent lanes/zones at the same time and in both directions of travel. 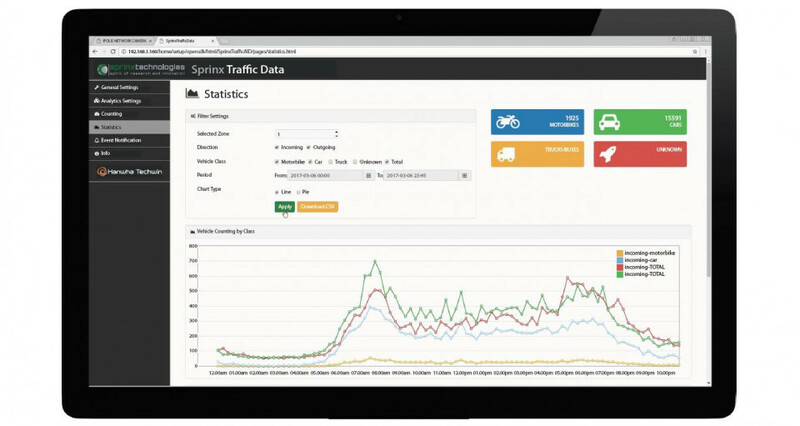 Sprinx Traffic Hub is a server software application for collecting and aggregating data from multiple network-connected cameras running Sprinx Traffic Applications on board. Through its web user interface, Traffic Hub enables a quick overview of all traffic events detected by the cameras and provides comprehensive graphs about traffic data such as vehicle counting and average speed. Traffic Hub includes a pdf exporting tool of the collected events, helpful for operators in evaluating the performances of the system. 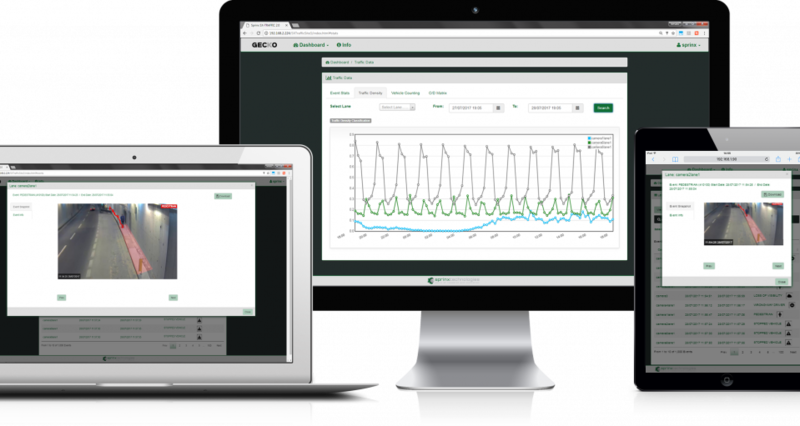 It also offers easy integration with 3rd party systems including ITS platforms, SCADA and PSIM. In complex architectures Traffic Hub can work as a proxy server forwarding all the events collected from the cameras to 3rd party software or VMS platforms. This features definitely simplifies the integration process avoiding the communication with every single camera connected on the network. The same communication interface enables 3rd party applications to disable some or all the detection features in the case of road maintenance.